The East & West India Docks & Birmingham Junction Railway between Camden Town and Bow opened on 26 September 1850. 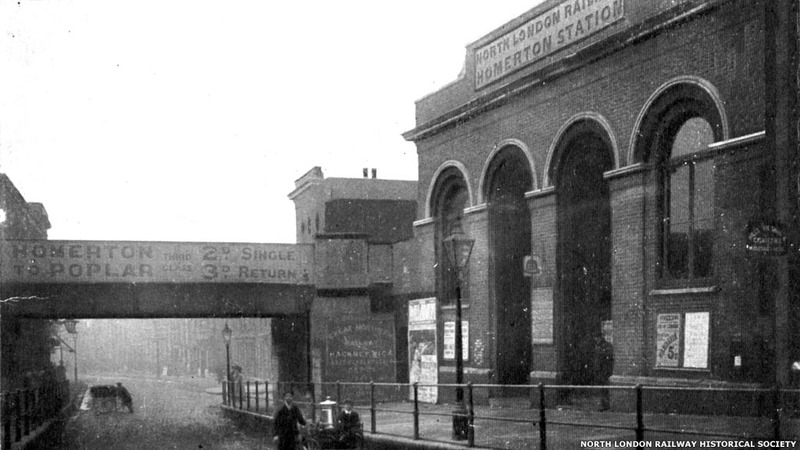 As the North London Railway it was extended to Poplar in 1852, and extra stations opened at Homerton, Victoria Park (which later became a junction as the line was extended in stages to Canning Town and North Woolwich) and Old Ford. Passenger services ended on 15 November 1944, after most stations suffered Blitz damage. Freight traffic finished on 3 October 1983 and the track south of Victoria Park was lifted. Only the section immediately north of Bow Road was reused by the Docklands Light Railway when it reopened the line on 31 July 1987. One photo on this page licensed for re-use under a Creative Commons Licence by Ben Brooksbank at Geograph British Isles.